Hold your horses there, hypothetical reader, and remember that with big data comes great responsibility and also great power. This time we’re using data to make massive gains in the stock market, worthy of any Wolf of Wall Street or small-time trader. Ready to learn how we do it? Using location data to trade stocks is not a new concept in the financial industry. For years, companies have been purchasing satellite data, which offers views of parking lots and industrial complexes and gives an insight into business activity. However, satellite imaging suffers from problems like cloud cover and accuracy in densely packed shopping centers and has essentially peaked in terms of its capabilities in making stock predictions. The future of this space is GPS location data. With X-Mode’s software development kit (SDK) in apps used by people all across the world, we can paint a precise picture of people’s foot traffic into retail stores, parking lots, and factories, and then create a strong indicator of a company’s financial health. 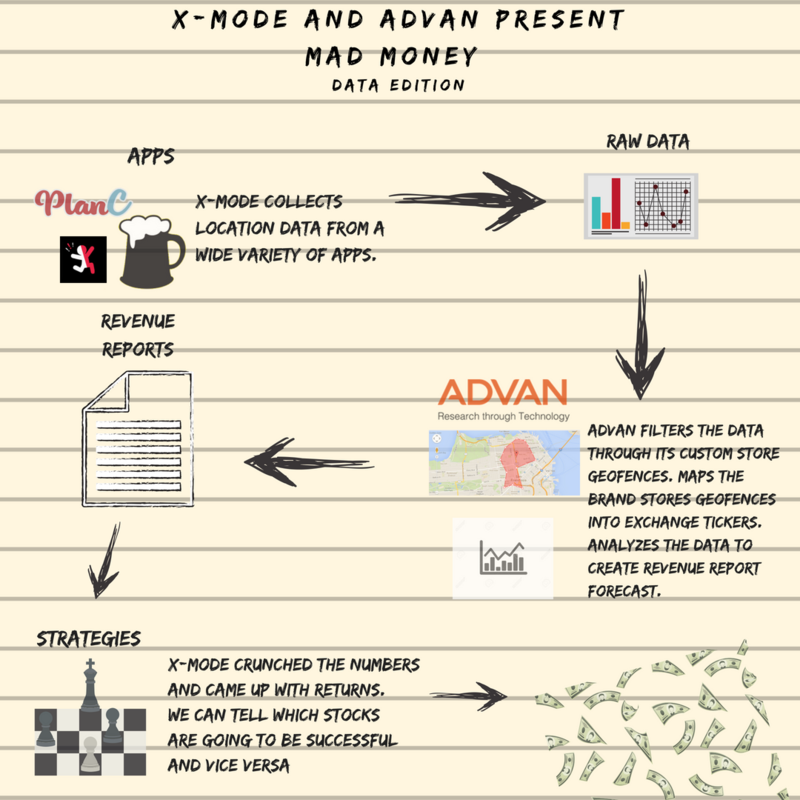 Our analysis stems from a partnership with Advan Research, a financial tech company which takes X-Mode’s data, filters it through its custom store geofences and matches it to stock tickers, and creates revenue report estimates. By comparing these reports to typical analyst reports, we can tell which stocks will blow investors out of the water and which stocks will lay flat. Here’s an infographic of how our process works, from raw data to mad money annual returns. The returns are amazing — 30 percentage points over the S&P 500 annually and already 10 percentage points above the S&P 500 for the 1st quarter of 2018 — basically doubling our money every 3 years! The caveat is that we are in a bull market right now, but in the future, all we have to do is continue to beat the market, which shouldn’t be difficult considering the quality of our location data. We also only tested trading on location data — no other data inputs, no momentum trading, no industry research. When the data is in the hands of a seasoned investor, the returns could be even higher. This new source of data poses benefits for hedge funds, day traders, and casual investors alike. A company armed with X-Mode’s location data could create an investing app like Acorn or Robinhood, sell data to hedge funds, or create subscription-based financial reports. And our location data is only becoming more accurate. In ten years, we could see lots of exciting new applications, such as monitoring the popularity of specific aisles in grocery stores, allowing economists and industry researchers to get laser-precise. Talk about an improvement from satellite imaging.